Luxury accommodation in Camps Bay, as well as self catering villas, houses and apartments in Cape Town's most exclusive areas: The V and A Waterfront, Bantry Bay, Clifton, Camps Bay, Llandudno, Hout Bay and Upper Constantia. These fully serviced flats compare to a 4 Star hotel accommodation with extra space, a full kitchen & privacy. Also 1 bedroom fully serviced apartments available in High Season from 1,100 Rands/ day with low cost ADSL broadband internet in most apartments. All these holiday apartments have high end finishes, satellite TV, granite kit tops, sound system, most are air conditioned. 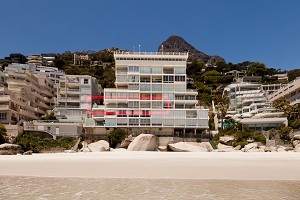 Clifton is wind free and the apartment measures 300 square meters. Fully renovated in 2010, all bedrooms and living areas have panoramic sea views. You can hear the waves with the windows open or from the large balcony. All 3 bedrooms are en suite. Reserved parking in the building, maid service & 24 hour concierge. Possibly the best location in Cape Town. This apartment highly desirable for your holiday stay ! 5 Palms Cottage is a self catering apartment with an upmarket feel that fits the budget of the average income earner. 5 Palms Cottage is a fully enclosed property that consists of 2 upmarket units. Each unit has two bedrooms, 1 bathroom, scullery, family room, kitchen/dining area and a separate toilet. African Bay House is a brand new luxurious and affordable self-catering and B&B holiday home situated on the coast at Simon's Town, Cape Town and caters for groups of 2-8 people. It is the home of the world famous African penguin Colony and Southern Right Whales. Come and enjoy your vacation at this dream-come-true location. 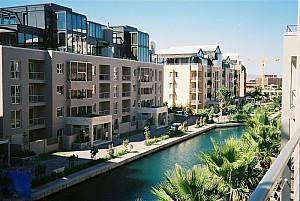 Executive self-catering apartments in one of Cape Town's bustling, cosmopolitan areas - Sea Point. Studios, 1 bed-roomed and 2 bed-roomed units available. Close to shops and restaurants and the beautiful Atlantic Seaboard. Camelot House will provide you, our guest, with a luxurious experience, a setting unequalled for the majestic grandeur of nature with open space and vistas, a setting only dreamed of, fit for a king. Situated in the Cape Peninsula national park forest, on the slopes of Table Mountain in the embassy belt of prestigious upper Constantia. Three bedroom flat,sleeps six, in Rondebosch a convenient, safe suburb of Cape Town. Lounge, small sitting room, dining room and well equipped kitchen. All linen provided. Close to shopping malls and restaurants. Within walking distance of railway with access to city centre and beaches. Parking at flat and security. Relax and enjoy one of the most breathtaking views on Earth. Luxury self catering accommodation on the sea front. A large private patio overlooks the rocks and sea of picturesque Bantry Bay. The apartment has 1 bedroom and a sleeper couch in the lounge. 2 bathrooms (1 en suite), open plan kitchen, lounge and dining room. Golden pond give's the tourist the chance to view and experiance 5star luxury in one of our 2 apartments, situated in the heart of lovely Cape Town, South Africa. Situated in exclusive area outside Durbanville, start of the wine lands.Only 20 minutes to Cape Town, Stellenbosch or Paarl and Cape Town International Airport. Pretty, two-roomed, self-contained, cottage in a quiet cul-de-sac in the picturesque fishing village of Hout Bay with mountain views. It has one double bedroom and lounge with fully equipped open-plan kitchen. Sleeps two, however, there is place for an extra bed for a child. 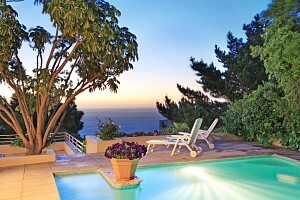 Francis House offers the visitor to Cape Town luxury self-catering accommodation on the sea. A 3-bedroom, 2 bath Victorian townhouse, Francis House is an easy stroll from South Africa's finest beaches and water recreation. The entire house is yours for your visit, and children are welcome. The house is situated on the upper slopes of Scott Estate in the small fishing village of Hout Bay which is at the southern end of Cape Peninsula. The house has been constructed so as to take advantage of the magnificent view; hence it has almost an entire glass frontage. The house sleeps six, is fully furnished and equipped. Twenty minutes' easy drive from downtown Cape Town, among yellow- wood, palms, wild olives, lemon trees and proteas, The HoutBay Hideaway is a luxury retreat overlooking ocean, mountains, beach and historic harbour. Manhattan's Luxury Penthouse lofts combines unsurpassed luxury with state of the art fixtures, allowing guests to fully experience one of the best destinations in the world. Stay at Manhattan's and enjoy the stunning visual splendour, vibrancy and activity of Cape Town from your ideally situated base. Luxury Apartments situated on the edge of the Atlantic Ocean. Ultra modern and spacious interior. All bedrooms have en-suite bathrooms. Magnificent sea view. Suitable for holiday or corporate rentals. Silverdunes is situated in Betty's Bay, a peaceful coastal town in the indigenous Kogelberg Biosphere Reserve boasting 1 600 different species of indigenous plants. Nestled between the ocean and rugged mountains, it is very conveniently situated, within easy reach of the Cape Town international airport (75 km) to the West. This well appointed accommodation is situated in a peaceful suburb of Cape Town. Close to beaches, mountains & shopping centres catering for all needs. The cottage is fully equipped with 2 double rooms and BBQ facilities, M-Net and a telephone. This magnificent self catering villa, situated in a nature reserve and directly fronting onto the Atlantic Ocean at Llandudno, offers stunning views across the bay. First impressions are of entering into a ship moored at the entrance to one of the Cape's most dramatic bays. The four bedrooms and studio each have their own special vantage point. Spacious apartment, 50m from sea. Wonderful views and sunsets; whales, dolphins and seals often close in shore. We also offer custom-made photographic safaris to the West Coast, Namibia and Botswana, and tours around the Western Cape.